The EDV-01 self-sufficient house is intended for use after a natural disaster. But it's too stylish; let's open one up now! EDV-01 is small, just 6m x 2.5m x 2.4m; but they weigh in at 10 tons, so they won't tip over in the light breezes following a hurricane. Each one has a bathroom, kitchen, beds, and satellite connectivity. You have a preference for off-the-grid living? No problem. There are also fuel cells and batteries along with solar panels on the roof; water is condensed from water vapor in the air. 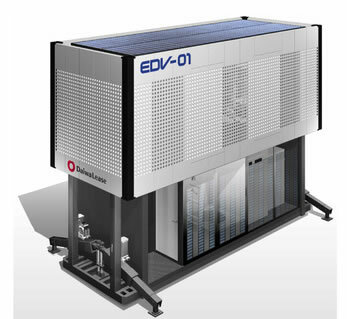 Take a look at the delivery system that goes with the EDV-01; start viewing at about 3:30 if you just want to look at the EDV-01 unit itself. Apparently, there is more to the EDV-01 than just a nice concept; Daiwa Lease is apparently trying to manufacture them. I like the idea of having a self-sufficient house that you can just drop wherever you want one. I read about it in Childhood's End, a 1953 novel by Arthur C. Clarke.